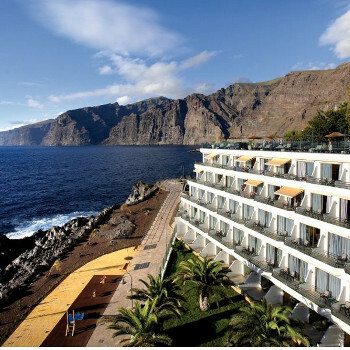 Set on a peninsula overlooking a blue bay and rugged cliffs, this fabulous hotel lies near the heart of Puerto de Santiago. The magnificent lagoon-style pools are surrounded by palms and sun terraces and offer wonderful sea views. We stayed here in May/June 2011. The room we had was overlooking the pool/sea and was fabulous with large balcony and electric sunblind’s. The hotel was very clean with antibacterial hand wash available in every part of the hotel. The food was fantastic - different things every night and always piping hot. Breakfasts were great too as was lunch either in the restaurant or in the bar area. The beer served as standard was San Miguel which really impressed us. All spirits were a good measure too. All staff were cheerful and friendly. Only criticism is the location - there is nothing there apart from a very small handful of shops and two pub type places one of which was very noisy at night but as we were on the other side of the hotel it didn't affect us. The entertainment was terrible though - the animation team tried their best but it was still pretty awful. HOTEL CLEANLINESS was very good. Lovely spacious bedroom and all clean bedding, lovely clean bathroom although you do get a bit of a sewage smell sometimes but have found that in most Tenerife accommodation in this area. HOTEL FOOD is fine but I do find it's a bit mish mash, can't seem to make a proper meal out of what they provide but there is a nice bit of choice and have always enjoyed what I've eaten. ENTERTAINMENT There is lots of entertainment to suit everyone. My husband and I booked up this hotel at the beginning of Dec 10 for Jan 11 and got a very good deal about 140 euros for 2 nights all inclusive. When we got there we were greeted by the staff and given a glass of bubbly, we were really looked after. It was nice going all inclusive for a couple of days as it was nice just going to the bar and not having to get any money out! I would definitely recommend this hotel. I will book up again for a couple of nights again, it's nice doing something different for a couple of days whilst waiting to head to our next accommodation. Please be warned of the rooms at the rear of this hotel.there are 2 bars directly opposite that play very very loud music, The route 66 bar that many people mention is ok because at least it stops at 12.am ..the karoke bar next to it played untill 6.30am !! flat out music . i like to party like the next guy but believe me it sounds like the speakers are on you balcony ! the hotel admitted they have this problem to the extent they have called the police on occasions but the music is always turned back up when they leave, I found it hard to believe they allocate these rooms knowing you cannot even begin to sleep. Very long story short that involed a completly sleepless night . many tears and stress we went to check out and find a different hotel, at my wits end i paid 160.00 euros to move to a suite which was the only room vacant. Please be warned .We forgot our first 24 hours and enjoyed a very good hotel if your lucky and get a sea facing room . if we never experienced the rooms from hell i would post as glowing review, but i had to pay 160 euros on top of my holiday just to enable any kind of peace and sleep.I would not risk going back or recommending it in case you experience what we went through. Lovely hotel for a quite , relaxing holiday. On arrival was given ground floor room which did not live up to the 4* rating, looked tired with worn and broken cupboard. Asked for move and following day moved to room on 4th floor (room 434) which was lovely with great views. Food in the hotel was very good and Dinner outside on the patio was a meal we looked forward to each night. Staff were very efficient but reserved. The All Inclusive option was extremely good value considering the exchange rate with the pound. in a good location for views over the sea to Los Gigantes & sunsets over La Gomera. The pool area is elevated, higher than many of the rooms,you may think its on the roof, but it isnt quite over any of the rooms. The food was very good,the hotel in general was very acceptable but we did not enjoy the enertainments. 1- One pool out of action & under repair. 2- The spa was closed for refurbishment. Street parking was not easy. There are a few bars/resteraunts around the hotel, none looked busy. the "beach" outside the hotel was taped off for safety reasons. There is a nice promenade which leads down to Puerto Santiago, with its black beach. The location is excellent and you cannot fault the staff or the rooms or the food . The food always has at least 2 meat and 2 fish dishes on offer as well as pasta dishes . Cold meats and salad are always on offer . Football/volley ball water polo and water volley ball are amongst the activities on offer . The hotel is mainly English German and French and we all enjoyed sport together. The only down side is the umbrellas are reserved by the guests from four oclock in with towels the morning but the sunbeds are locked till eight oclock . Just returned from a week at this hotel. It was an enjoyable stay, the food in the hotel is the best I have been to, wide choice of food both breakfast and evening meals, something for everyone. The main down side of this hotel was the pool and sunbathing area. It had said a beach 200 metres, but this was just a rock area and you could not sit there, therefore everyone used the pool area. The pool itself was extremely busy all the time and quiet noisy with pool games etc. There is insufficient sunbathing space for the number of guests. Umbrellas are usually taken by about 6.00 am, and the sunbeds are open from 8.00 am with people waiting to take them, reserving your umbrella is not suffient to give you a sunbathing area, you need to be there again at 8.00 am to get a sunbed. You are all very on top of each other with no space available. However, the resort area was nice, relaxing and the hotel was very nice. However, the sunbathing area made it disappointing. This was the first time that we had gone on an all inclusive holiday, Previously we have been going on Thomson Gold holidays. We were not disappointed. Excellent value for money and more than we could have wished for. Although the AI finishes at 11p.m we found this ample and had no trouble getting served. Sangria. beer, wine, cocktails, bottles of water, soft drinks, coffee, ice creams etc. available from 10a.m.from self service section by pool. Bedroom (559) very spacious with excellent balcony and stunning view. We were on the 5th floor overlooking the bay.We would not have liked being on the ground floor on this side of the hotel as the balconies fronted the walkway in front of the bay and people walked past on the same level. Room and hotel very clean and excellent amount of storage. Hotel food very good. Excellent choice at breakfast,lunch and night time. Nice outside eating area. It was usual to queue for the tables outside . On the days that we chose to do this we never waited very long. If you go on a trip that leaves early you can arrange an early breakfast the night before.Hotel was in a stunning location and nice walk to Los Gigantes and in the other direction to the next 2 or 3 beaches. Unfortunately the only beaches nearby have the black sand. Hotel staff were execellent. The entertainment was a bit mixed with some acts brought in and shows put on by the entertainment team. 85% of the guests are German and the music was geared to them in the main. On this point let me tell you about reservation of sunbeds. There are ample sunbeds for everyone but insufficient parasols for all. There is a notice in reception that says sunbeds cannot be reserved and towels will be removed. This is not true. We and other british guests found that at 5.30a.m. and 6a.m. the majority of sunbeds with parasols had been reserved!!! We went to the spa in the hotel. We paid 10 Euro for 1 1/2 hrs and this was well worth it. Turkish bath, ice showers,sauna etc. very tasteful and relaxing. We would go back to this hotel as we could not fault it however it is unlikely to be next year as we would like to be able to bathe in the sea on some of the days and this wasn't really possible unless you walk to Los Gigantes and use the fresh water pool which is stunning but very hard to get to if you have any mobility problems as steep steps access down. we did have a sea view. Our room was cleaned every day and towels changed when we wanted them changed. The food was what you would expect from a hotel of this rating and plenty of it. The breakfast bacon was the crispiest I have ever eaten and not smoked. The cheese board even had Brie, first time I have come across that on holiday. we had no problem getting served with drinks even though we were all inclusive. There is an area around the pool where you can help yourself to beer,wine,soft drinks etc. The hotel is in a small quiet resort we enjoyed it for a week but two weeks would have been stretching it. The hotel staff were on the whole friendly some more than others but that is human nature. We did not watch the entertainment but it seemed to be the usual, mini disco and the animators doing shows some based on TV programmes. The only downside to this holiday was that there are not enough parasols to go around and we had to go down at 7am to secure one as we burn easily. On the whole we thoughly enjoyed our break.